for help please see the "how to" section below. We only supply genuine working VW radio unlock codes with over 100,000 customers served. Available: Today 8am to 5.30pm. Orders after are delivered next day. Finding your Volkswagen radio serial on the radios label. To remove your VW radio will require radio release keys. These inexpensive tools are used by pressing the keys into each corner of your radio until it clicks into place. Once all the keys are in place the radio will now be able to be pulled out of the dashboard. There is no need to disconnect any wires as the information on the radio will be on a sticker on the casing of your radio unit. There are different types of Volkswagen radio labels and sometimes identifying the correct information can cause issues. It is quite simple to find the your serial number it will start "VWZ" an example is "VWZ1Z2H1234567" ensuring your VW serial is correct is essential in retrieving the correct code for your radio. 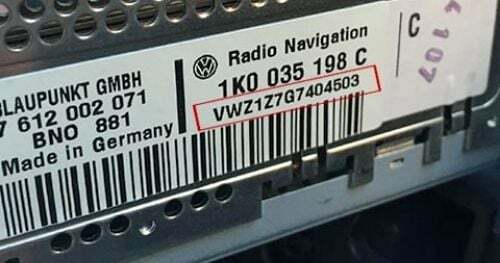 IF your car radio is a Volkswagen navigation system, it will have the number "7" on the 6th digit of your serial number also, your serial will have a serial similar to this example "VWZ1Z7H1234567". If your Volkswagen radio is a navigation system these can be purchased here. The most common issue with entering Volkswagen stereo codes is "SAFE" being on the screen, To override this press and hold down "Scan" & "Mode" for around 5 - 10 seconds. Your radio will now allow you to input a code and will display "1000", Entering the code is easy using "4573" as an example of code entry we will show how input the decode. Press button "4" three times to display a "3" in the fourth column. Checking the screen to ensure the code "4573" is correctly displayed, press and hold "Scan" & "Mode" this will input the code into the system and your radio will be working again. All Codes are static and never change so if this happens in the future enter the same code the radio will unlock again and again. We offer Free lifetime radio code retrieval on all our codes that have been purchase from OnlineRadioCodes previously. Why Choose us to Decode your Volkswagen Radio? Most of Our Volkswagen radio codes are instantly available, and display on screen after purchase. You can also call our radio experts on 01942 604333 to obtain your radio decode instantly over the phone via credit or debit card. Our phone lines are available from 9am - 5:00pm (Mon - Fri). We also offer a free Volkswagen radio code lifetime code retrieval service, so if you ever misplace or lose your stereo code you don't need to worry! The code we provide is the original code for the radio supplied when the vehicle was first manufactured. Radio decodes are requested directly from our large databases or decoded in house by our specialist radio decoding tools.